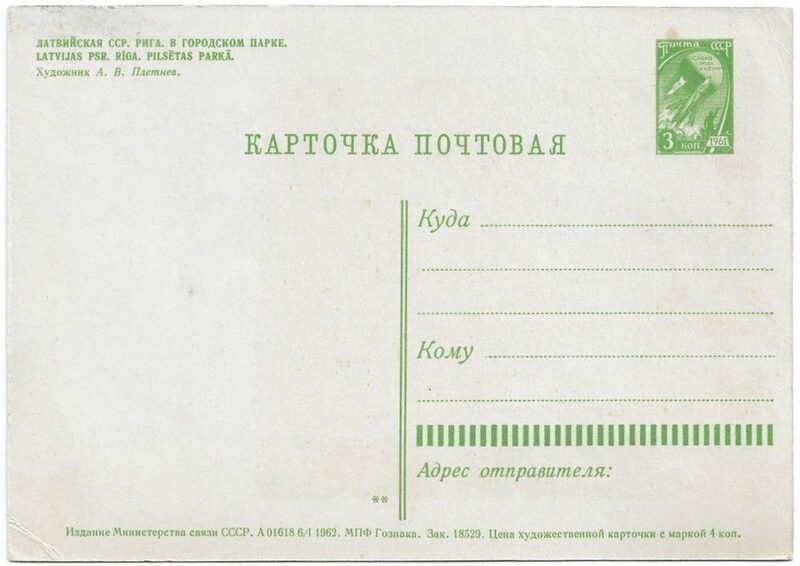 In the Soviet period, many postcards as postal stationary are issued. 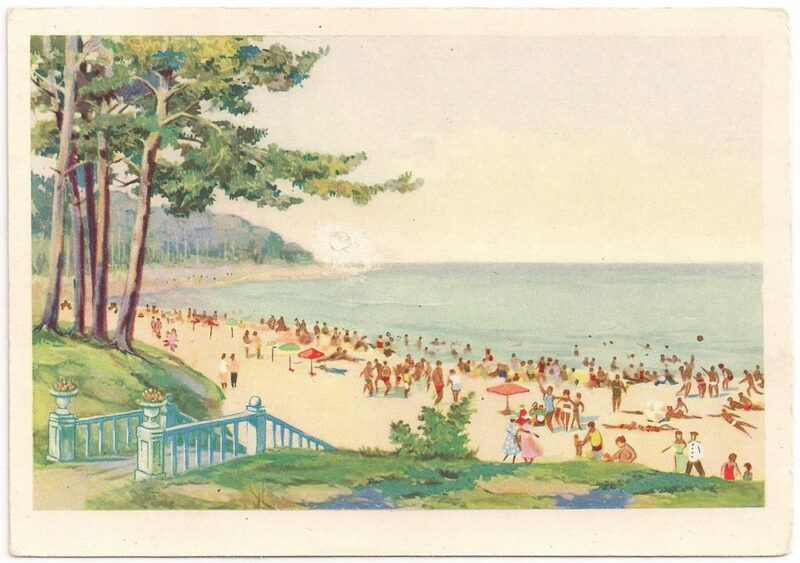 Also many cards have an image from the Baltic. These postcards are part of our collection area. Based on this book by von Hofmann and my own collection, I have made a list: downloaden as pdf. This card is an old card, the oldest, with a Latvian motif. The imprinted stamp exist in more types: on the mausoleum 1 or two lines: Lenin or Lenin and Stalin. 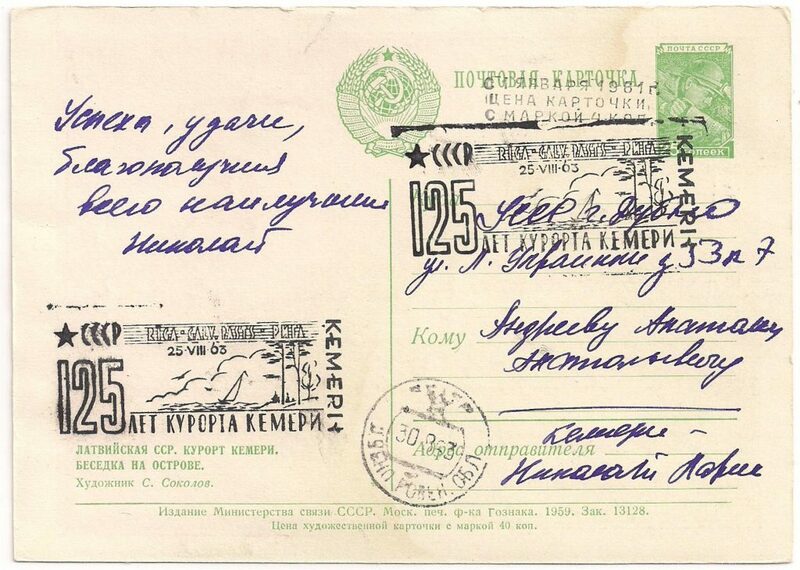 On the stamp here you see >>> two lines, the indication for Lenin and Stalin. 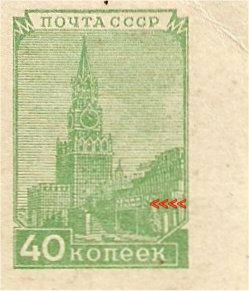 There is also a difference in printing: Type I: Typography, only vertical lines in the tower (inscription on the mausoleum 1 line: Lenin). Type II: Typography, only vertical lines in the tower (inscription on the mausoleum 2 lines: Lenin and Stalin). So this stamp is type III: offset. 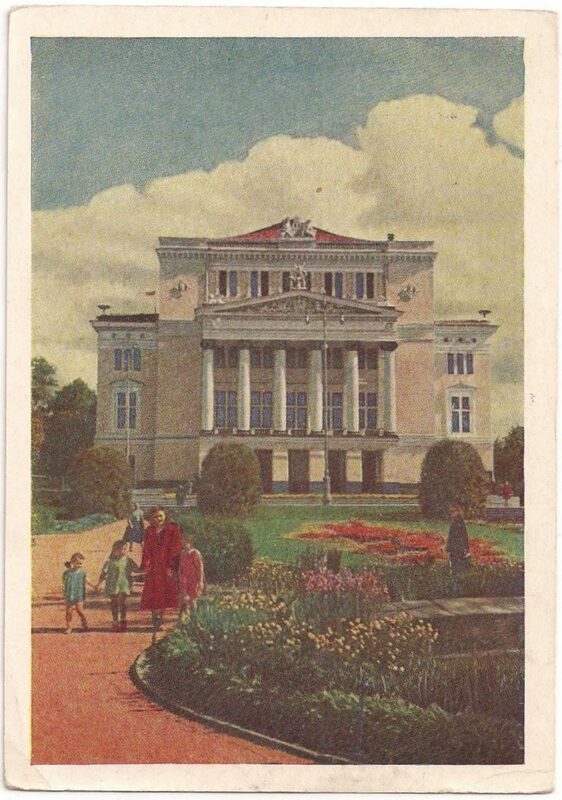 The description of the picture – the Theatre in Riga- is only in Russian. Later cards have also a description in Latvian. The coat of arms has a total of 16 ribbons and text in one line as points: so type IVC (in the Michel Ganzsachen-Katalog). The coat of arms: has left and right ribbobs and 1 ribbon at the bottom, with a text or a text only by dots indicated text. The text: “Proletarians of all countries unite”. In the Michel Ganzsachen-Katalog (MGK) the postal stationery cards are classified according the series permanent postage stamps. In the 8th serie permanent postage stamps (1948-1960) are three stamps used for the postal stationery cards: the Spasskitower (mi. 1336), the coat of arms (mi. 1335) with and the miner (mi. 1331). 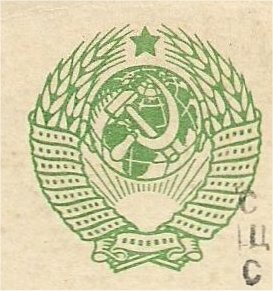 The card above has lines for address and sender, coat of arms IV C and printed in green: must be P219 A.
IV: Publication-number Ш……, with date and issue-year 1954. 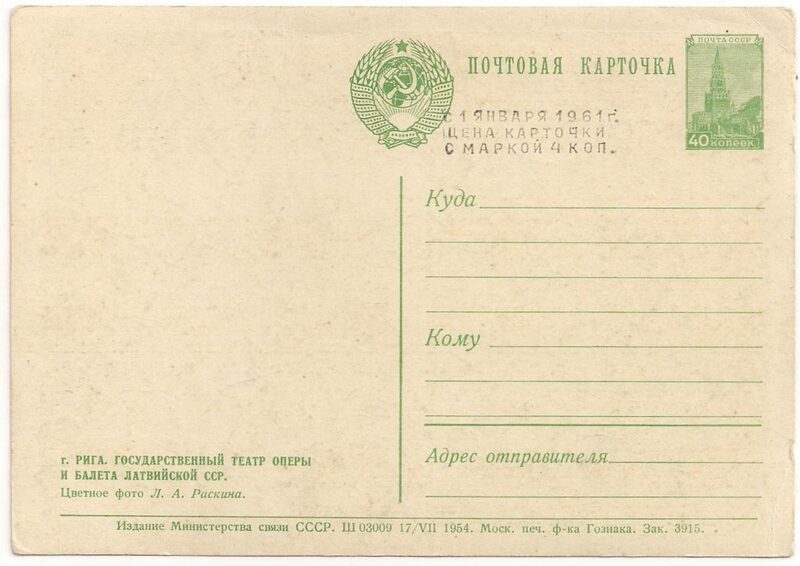 The card above has as publication-number Ш 03009, with date 17/VII and issue-year 1954: P219A, IV. MGK (Michel Ganzsachen-Katalog) mention under P219A, subdivision IIa cards with picture. 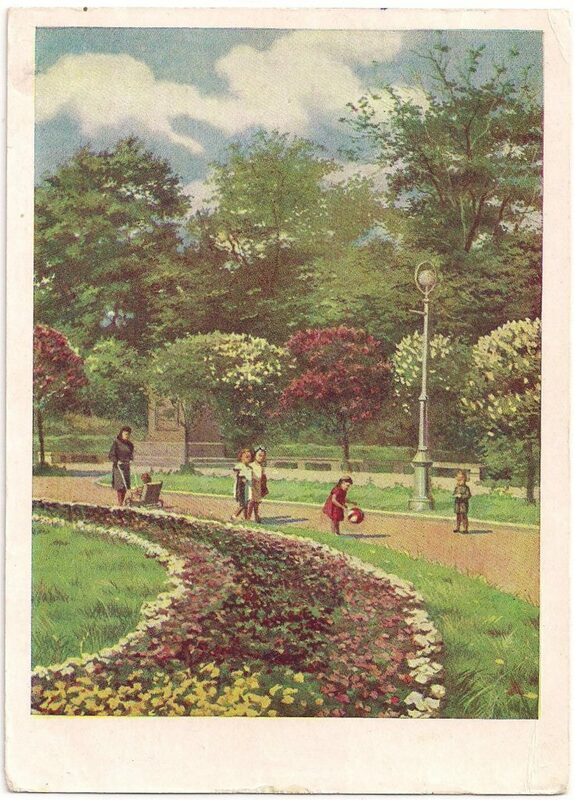 Here also the interesting card ‘Lenin-Stalin-Mausoleum (5/VIII 1954)’. 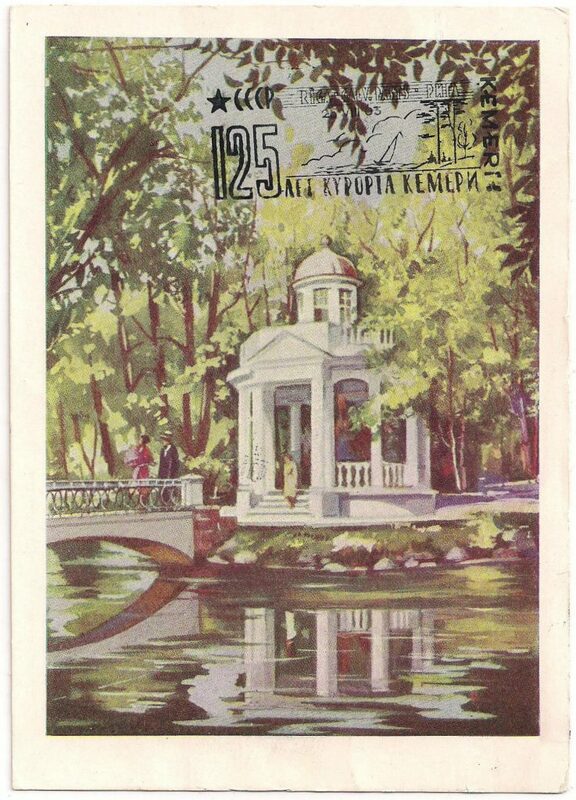 The picture of this card has above the mausoleum clearly indicated Lenin and Stalin. Card, issued 1957. The city park in Riga. 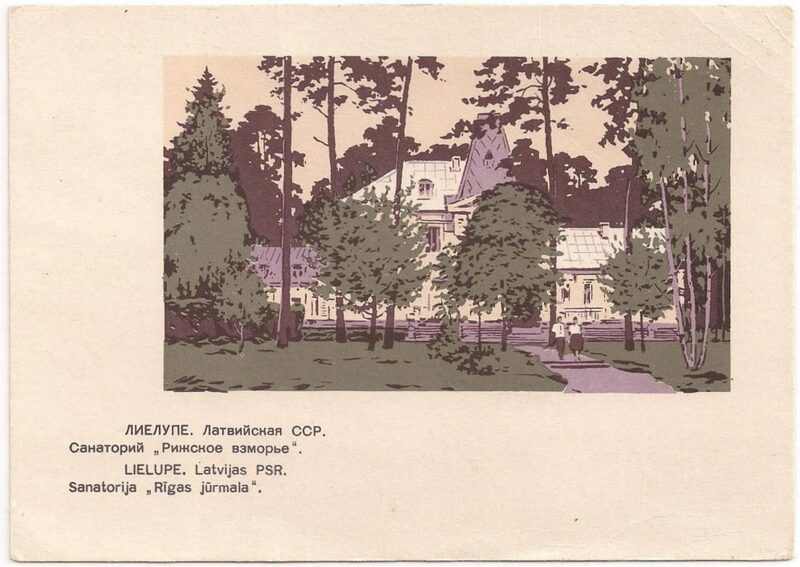 On the address side of this card is indicated -bilingual-: ‘LATVIJAS PSR. RĪGAS JŪRMALA’ . Also the художник (=artist) is mentioned here. On the bottom line we see the printing data. 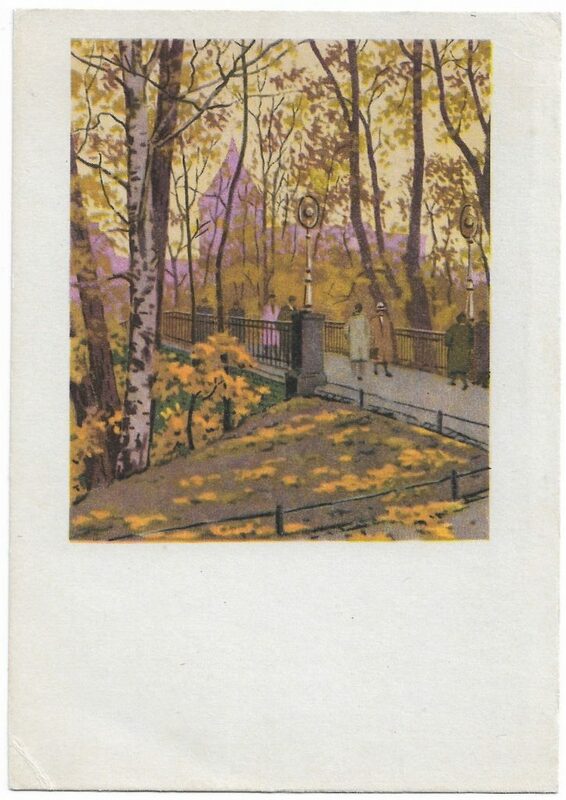 The card is issued in 1961 and printed in the МПФ ГОЗНАКА, the abbreviation for МОСКОВСКОЙ [MOSKOVSKOI] ПЕЧАТЉОЙ [PECHATNOI] ФАБРИКЕ [FABRIKE] ГОЗНАКА [GOSZNAKA], Moscow Printing Factory Goznak. Number 16084 is the number of the ЗАКАЗ [ZAKAZ], order. 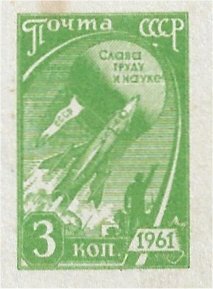 A stamp of the 10th series permanent postage stamps, with the year 1961, is used as a stamp: a starting rocket. 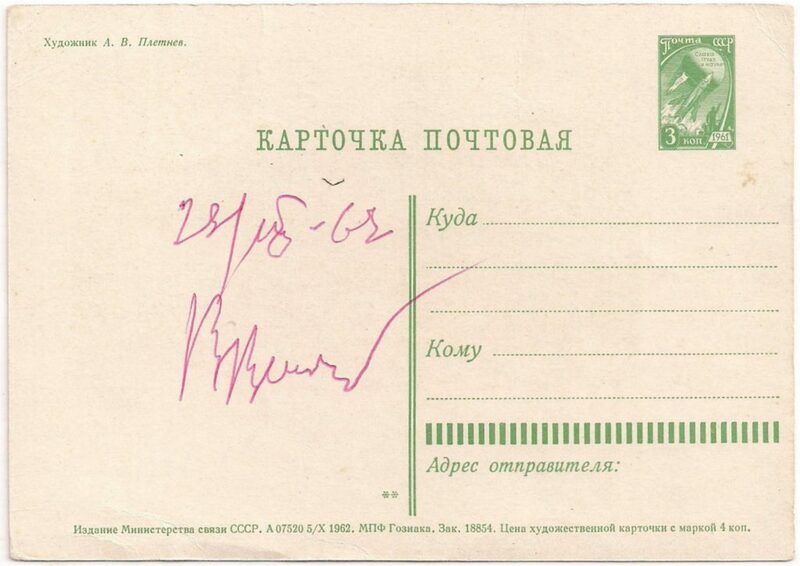 This postal stationary with МПФ ГОЗНАКА and imprinted stamp Type II is in the Michel P 285, subnumber III (only the year, not a number starting with A in the printing data). 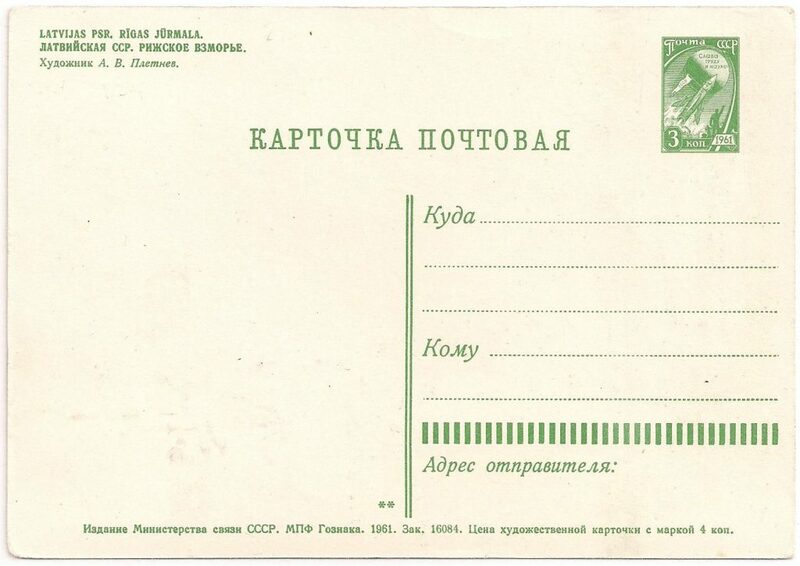 After the printing data Na de drukgegevens on the line at the bottom is still mentioned: ЦЕГА ХУДОЖЕСТВЕННОЙ КАРТЧКИ Р МАРКОЙ, Price of the artistic card with stamped stamp. And that was 4 kopecks. In 1946 Rīgas Jūrmala is added to Riga as 7th district. Ķemeri en Sloka were – and remained – autonomous. 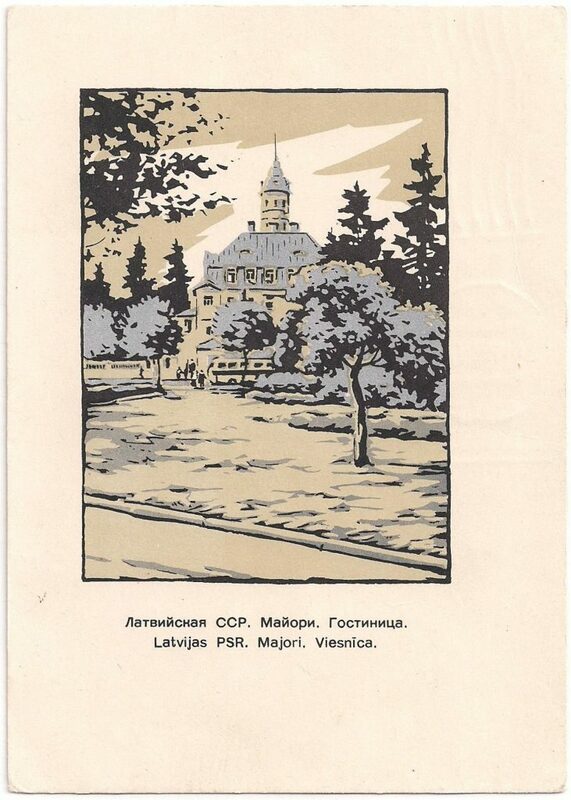 In 1959 Jūrmala became a city, including Ķemeri and Sloka. LATVIJAS PSR. RĪGA. PILSĒTAS PARKĀ. Card, issued January 6, 1962. Riga, city park. Card, issued January 6, 1962. 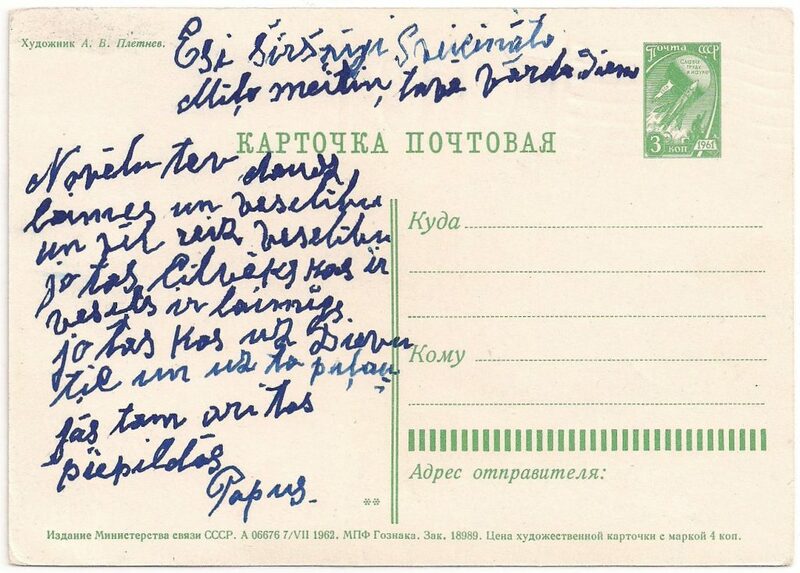 On the address side of this card is -bilingual- indicated: LATVIJAS PSR. RĪGA. PILSĒTAS PARKĀ. Also the художник (=artist) is mentioned here. 1. 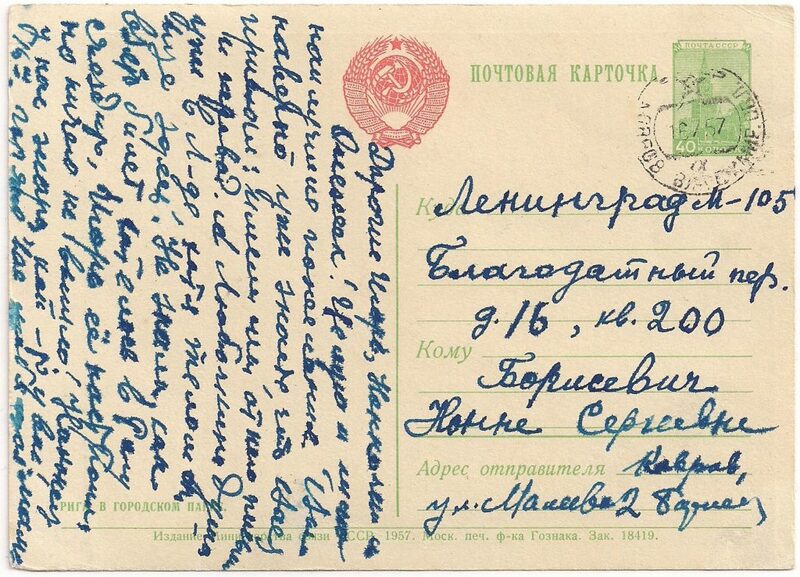 In 1961 with state arms in the middle above the –single one- dividing line between the address data and the written message from the sender, printing data in 2 lines. In MGK: P 276-277. This card (and the previous one) fall under the second group: P 282-287. Majori is the central district of the seaside resort of Jūrmala. Below an image of the hotel ‘Majori’. Card, issued July 7, 1962. Majori, hotel “Majori”. The description of the image is now placed on the image side. Viesnīca is the Latvian designation for hotel. The well-known hotel “Majori” was built in 1925 under the guidance of the architect A. Medlinger in an ‘Art Nouveau’ style (or ‘historicism’ style). In the crisis of 1932 the hotel had to be auctioned. The precious interior went partly to castle Sigulda. In 1991 the hotel was renovated. On the eastern edge of Riga’s Jurmala lies the fishing village of Buļļi (Bullen), now Lielupe. The description of the image is now on the front. Card, issued September 5, 1962.